Like James Dean, James Gandolfini‘s life ended too soon to spread his talent as far as it was bound to take him. Fortunately for Gandolfini fans, he made more movies than Dean — that forever-young icon of the ’50s. Now comes another picture to get to know Gandolfini’s act even better. It’s a role that’s about as different from Tony Soprano — his breakout HBO character — as could be. His name is Albert, the male lead in Nicole Holofcener’s “Enough Said.” Albert is the love interest of Eva. Julia Louis-Dreyfus, scoring well this past week in the Emmy department, plays Eva — a middle-aged divorcee whose daughter, Ellen, is about to leave home for college. Albert is a librarian of sorts at institution that holds historical material of television programming, and Eva is a masseuse. She travels about the city massaging clients at their homes. Surely this must sound like rather routine living for ordinary people. How many movies are released every month that have narratives set in the ordinary and could be a TV sitcom too? Not just a few. Don’t let that fool you. Although “Enough Said” has lots of the ordinary, it does it with abiding perspective, superb dialogue, plenty of laughs and more warmth than you might expect. And it made me a little sad. 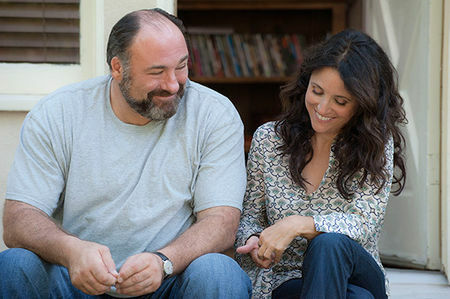 That James Gandolfini recently died surely contributes to the sadness (at least for me), but the film itself helps bring that emotion, especially in terms of parent-child relationships. 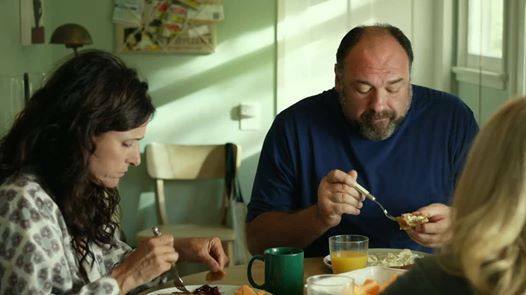 The two young women playing daughters in “Enough Said” add much to a film that’s already well-stoked with the charisma Gandolfini and Louis-Dreyfus bring. Tracey Fairaway (“The Bling Thing”) plays Ellen and Tavi Gevinson is Chloe — a close friend of Ellen’s who spends more time at Eva and Ellen’s house than at home with her own mom. This subplot enhances the primary focus on Albert and Eva’s relationship. The maturation of the Albert/Eva relationship is where the film spends the most time, much of it in dandy, cute, sweet yet candid repartee between Albert and Eva. They like one another a lot and you will like both characters a lot. At about the same time, Eva makes the acquaintance of woman who identifies herself as a poet. Catherine Keener does the role of Marianne. As the plot would have it, she’s in need of a good massage, so Eva begins a schedule of massages for Marianne at the poet’s home. They become good buds while Eva maintains her intimacies with Albert. Eva also spends time with a longtime family friend, Sarah (Toni Collette), and her sort-of-a-jerk husband Will (Ben Falcone). Eva updates Marianne on developments with Albert, and Marianne, also divorced, reflects on her unhappy times with her former husband. Turns out that Eva becomes aware that Marianne’s ex is Albert. Neither Albert nor Marianne have one foggy notion what’s going on. The only culpability on the part of Eva is … when she realizes Albert and Marianne were once married … she says nothing. Eva begins to feel misgivings about her happenstance secret while Albert and Marianne remain in the dark. This, with the young gals complicating the mix even more with their vastly different life problems of the moment, makes for a full plate of necessary resolution (if possible) for the characters. On the surface, as I say, the story sounds hackneyed, if not flat; but once again: that’s not the case. The script and accompanying dialogue, casting and directing make “Enough Said” more than just a solid offering for any movie patron who might possibly be overwrought a little by this summer’s extended film parade of apocalyptic violence. Nicole Holofcener, who also wrote and directed episodes of HBO’s “Six Feet Under,” NBC’s “Parks and Recreation,” as well as the feature film “Friends With Money,” projects a knowing hand at making stories about authentic human relationships and down-to-earth events that, somehow, seem not inclined to leave your brain.